Sold out walk with Tasting counter! Very special event! Thank you to everyone who came, what a great pair of groups! 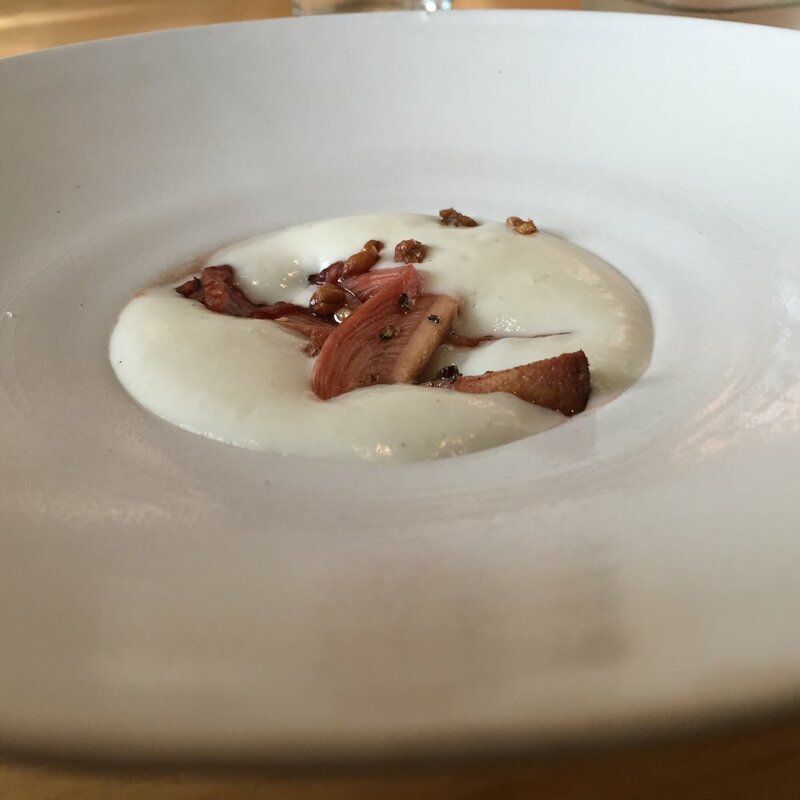 A walk in woods and a dinner at journeyman restaurant. This walk turned out to be one of the more fruitful walks this year. Though we were met with a few fungi here and there, including the unusual Beefsteak polypore, there was not an overwhelming amount of mushrooms most of the day. That is until we were almost out of the woods, and just as we turned there was a large down tree, covered in chicken mushrooms! Really it seems sometimes the mushrooms gods decide to shine down upon you and reward all the days efforts. Other finds included the poisonous Amanita, edible parisol mushrooms, wild relatives of the button, and a giant berkeley's polypore. As for dinner, Tru Lang of Journeyman in sommervile put together a truly memorable dinner, with small dishes highlighting the variety of flavors and textures of the mushroom kingdon along side local produce, expertly prepared. There was popcorn dusted with chicken mushrooms for the table, lobster and lobster mushroom bites, beefsteak polypore lightly cooked along side some super puffy potatoes that were like eating delicious little clouds, lions mane with smoke blueberries, an awesome squid and lactarius shared plate, the "two birds of the woods" (chicken and hen) with okra and tomato, shrot rib and chanterelles!! !UHG, and desert that had stone fruits with white chanterelles!!! 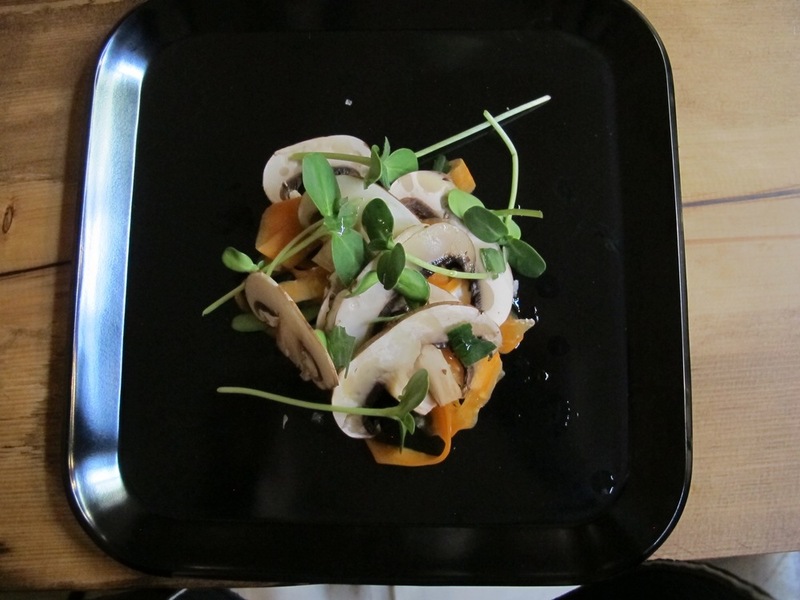 each mushroom's flavor and texture really danced on the plate. A little dry out there... in fact a lot dry! there were very few to no fleshy mushrooms out there. Goes to show what drought does for the fungi, and that every year is different. Last year this time were many weeks into a good mushrooms season. Luckily Jade and Pete put together an incredible meal that saved the day. Many courses that highlighted the variety of seasonal fungi (that we should have found) as well as her very own produce grown just an hour away! Dishes from farm weeds over brittle gill mushrooms and boletes, to pour over clam and "clam mushroom" soup, and an awesome corn custard dessert with chanterelles. A meal to be remembered! Next up with Jade may be a walk/dinner and a movie event showing the film "creeping forest". A film all about the fascinating slime molds. I know it sounds weird, but they're SO COOOOOL! if it happens it will be not to be missed! 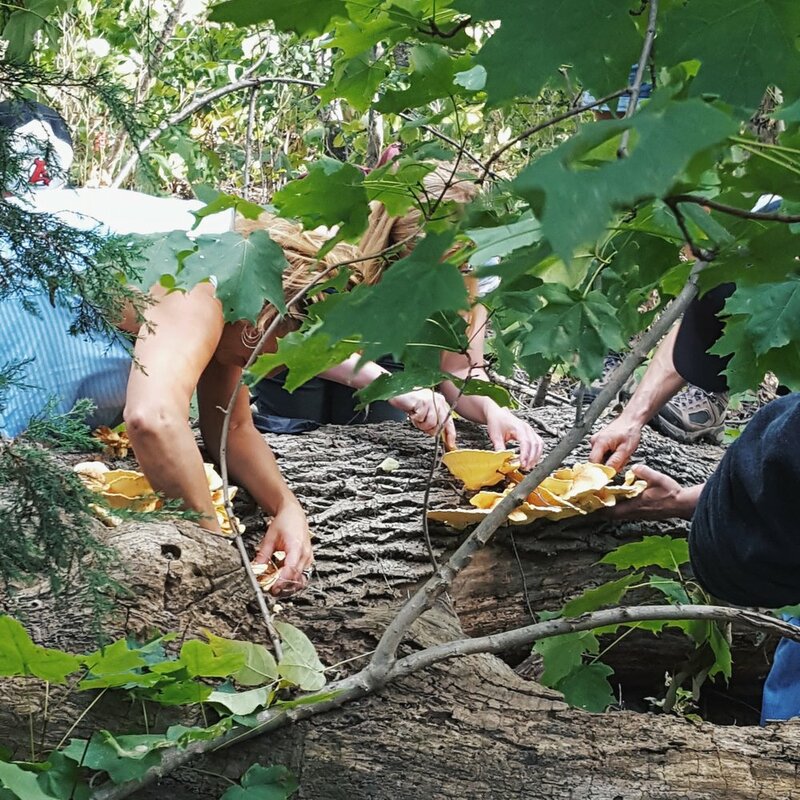 Urban foraging and Dinner with Company Picnic! This class covered spring edibles like wild mustards, nettles, alliums (onions), black locust and more. Avery special dinner by Andrew and Sarah of Company Picnic saw striper, morels, ramps, pickled knot week, and many others wild ingredients. When we arrived for dinner we were greeted with cocktails and a beautiful decorated out door dining experience. Such a delight! April 17 2016: "Urban Foraging" for Obscura Day in Fraklin park hosted by Atlas Obscura as part of their world wide day of events that celebrate the unusual and hidden wonders. 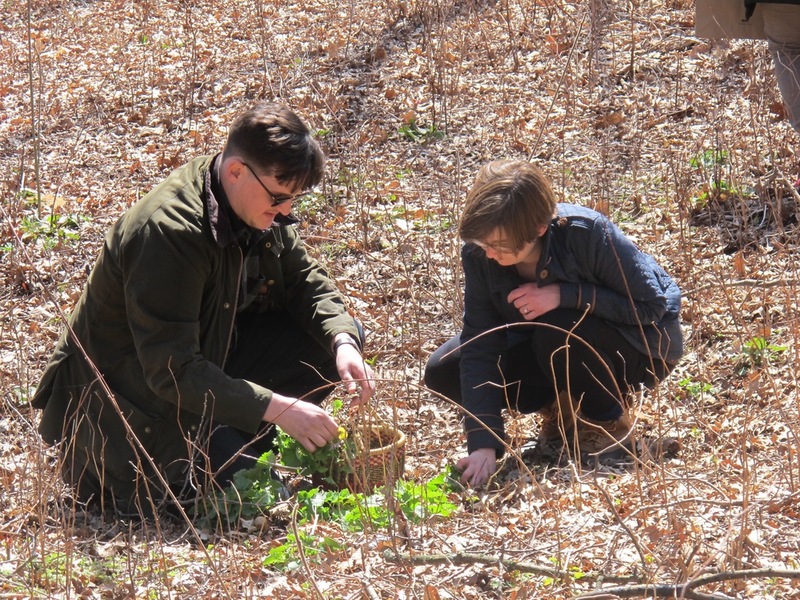 The afternoon was spent foraging ingredients like stinging nettles, knot weed, wild mustard flower "broccoli rabe", garlic mustard, violet flowers, and more. Sept 19-20 2015: "Adventure Club" with Della's Diner was a blast. 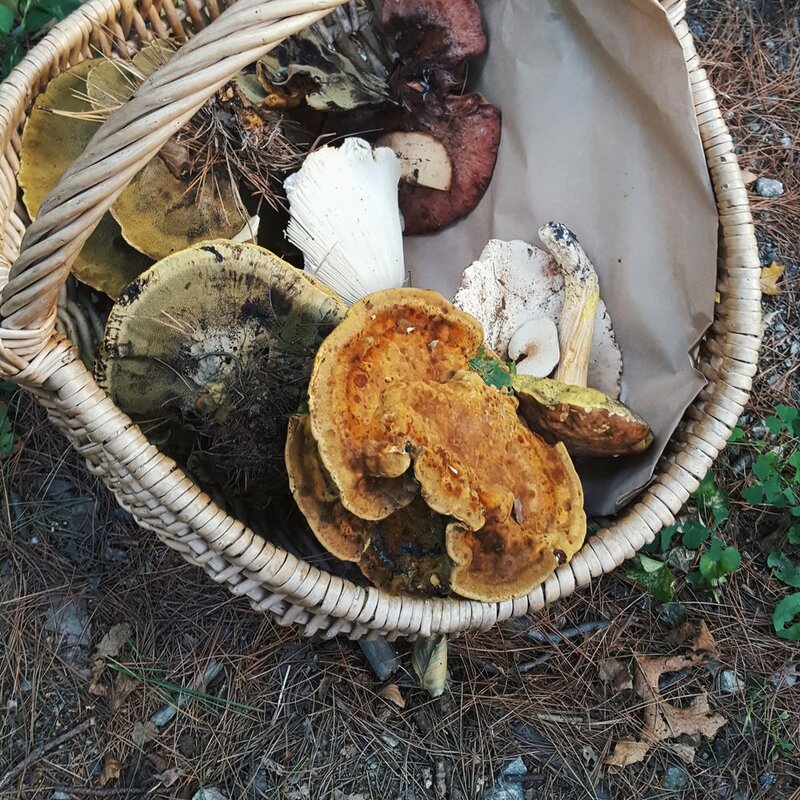 We spent the weekend at Lake Ivanhoe Campground in Wakefield New Hampshire finding chanterelles, black trumpets, yellow foots, hedge hogs, boletes, and many other beautiful fungi. We were also lucky enough to find the season's first Hen-of-the-Woods!!! Meals prepared by Della Diner with our ingredients was superb and then we stayed up into the wee hours of 10pm with a walk to the lake. We woke for a mushroomy breakfast send off.